If you are buying a giclée print from an artist ask them to describe the production process and materials to you, if they want you to pay the quoted price they should be able to explain what makes their giclée worth paying for. Possibly the two questions I get asked most frequently by both customers and other artists. 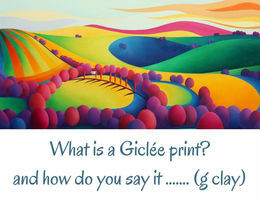 Lots of artists sell Giclée prints but not many people know what they are and that is quite simply because the term “Giclée” (pronounced g clay) only came into use about thirty odd years ago to describe a new inkjet process producing high quality prints. As of yet there is no industry standard for a Giclée print. A Giclée could be archival, printed on acid free, fine art papers in a professional studio with fade resistant inks on a high range printer but it doesn’t have to be. One artist may describe their prints as giclée another as digital and yet the two may be produced in exactly the same way with exactly the same materials. Unless you are scrupulous and read all the small print both artists and consumers are often in the dark as to what any of this even means let alone exactly what they are getting. So what exactly do you get when you purchase a Giclée print from Sarah Duffield? You get a print produced in a professional imaging laboratory using a ten colour top of the range printer (your average household printer will use a mixture of four coloured inks) The fade resistant inks used will look the same under a range of different lighting conditions and create beautiful, softly blended colours (so important in my work) which last much longer than an average digital print. You get a print that has been looked after. Oil from skin can damage fragile papers so no one at my printers will touch your print without gloves on, I only touch the outer white edge to edition and sign before handing it back to a professional to be rolled, packaged and sent out. And how should you look after it? Giclée prints are very fragile – Your print comes with a large white boarder for framing purposes and to help keep it safe. If you need to pick up the print only touch the white edging so as not to damage any of the beautiful inks. Your framer should know how to handle a giclée but if you’re not sure a gentle reminder should not cause upset. Finally, remember that although your giclée print will last for nearly a hundred years if stored flat and kept in the dark please do not do this, it would make me sad. Hang your beautiful print somewhere out of direct harsh daylight, avoid areas that often have a bright, reflected patch on sunlight on the wall and most importantly of all enjoy your art. Please feel free to share and re post, email me with questions or even comment - I love a comment.